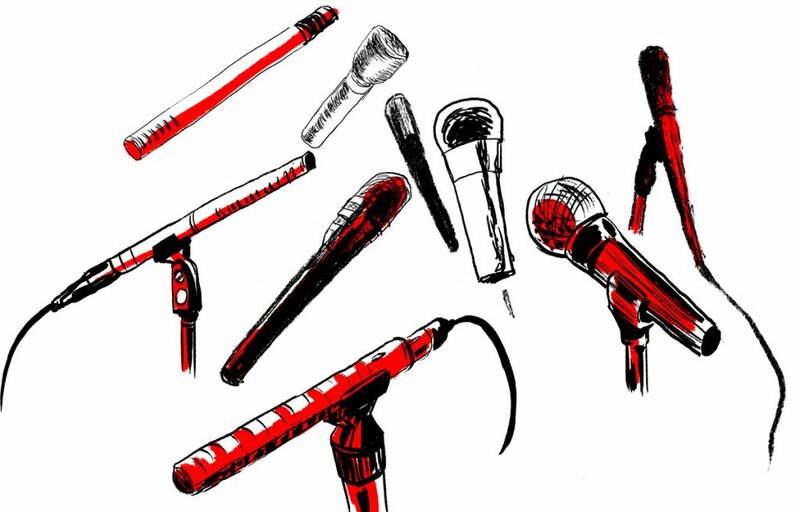 Liz Jones (@KUOWLiz), a reporter with KUOW, contacted us with an idea after the Which Mic Should I Use? post published. She recommended we get the input of various reporters in the field to hear about what mics they are using and why. Good idea! Also, I have a Shure Beta 57A, but that doesn’t travel. That’s just for tracking at my desk. I normally use the Sennheiser MD 46 mic. I like it because it’s versatile and works well in most situations. I’ve used it to gather nice background ambi, and get clean interviews with folks in a natural setting. I also like that the mic has a nice warm tone to it. If there’s a lot of background noise (parties, big crowds, etc.) I prefer to use our shotgun mics. The Sennheiser MD 46 is a dynamic cardioid microphone. Learn about those characteristics in Which Mic Should I Use? I almost exclusively use my AT897 shotgun mic because I do a lot of indoor interviews with a single interviewee. But I was recently collecting tape outdoors for a story I’m producing about a weekly gathering where people dance in public. It was a windy day and I was recording the warm up. My shotgun was a picking up a ton of wind noise (I don’t have a zeppelin), so I swapped mics and used my Beyer Dynamic M58 omni. I use an Audio Technica AT-897 shotgun about 98 percent of the time with a Rycote 3DTex wind muff and Rycote pistol grip shock mount. I like the directionality for one-on-one interviews in noisy environments. I also have a Shure SM58 in my kit for occasional tracking from the field and micing lecterns. The Shure SM58 is another dynamic cardioid microphone. I use an Oktava MK-012 condenser mic with interchangeable capsules (omni, cardioid and hyper-cardioid) that lets me decide how much ambience I want to record, depending on the environment I’m in. I use the omni capsule to record ambience and active scenes, like at a farm or city hall. When I need things to be quiet, like for tape syncs or interviews where I can’t control the noise, I use the hyper-cardioid. The cardioid capsule strikes a good balance between the two. 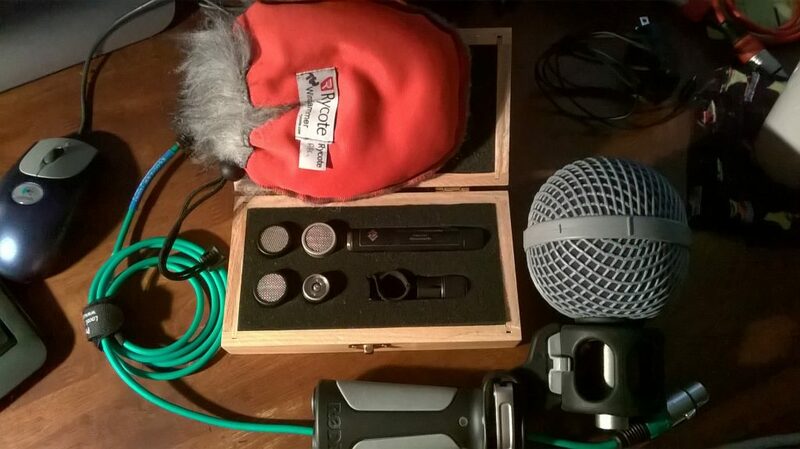 The downside is that it needs a Rycote suspension system to eliminate handling noise and plosives, so it’s more complex and expensive than a typical ENG mic. But the versatility you gain (three mics in one!) — and the clarity of the mic — make it as good of a system as I’ve heard. Oktava MK-012 rig with Rycote suspension. Photo by Thomas Walsh, WWNO. I carry an RE-50B omni for doing field interviews with either a) background sound that I want to include or b) with a wind screen when there’s a lot of wind. I carry a Cobalt CO-11 for indoor interviews because I like the warm sound and the cardioid ability to focus on the speaker. I carry an Audio Technica AT897 shotgun, with a stick (boom pole) and a Rycote cover, because I wind up working around television and in scrums a lot and it just isn’t practical to stand within an arm’s length of the people who are talking. This is becoming increasingly true, as outlets shooting video have proliferated and news scenes get increasingly crowded. I also carry two electret mics in my bag. One is a Shure C090 lav mic. I like it for extended interviews, because it has an XLR output and I can just clip it on someone and talk to them without a lot of mic interaction. The final is an Audio Technica C-87 MkII. I like that it has a battery and high output. I use a TRRS cable adapter to record directly into my Android phone to upload live hits from the field directly to MPR, so an editor can chop out a chunk and turn it into a spot. DPA 4060s, concealed behind my ears, for “stealth binaural.” You can hear why … and some of the sounds I got … on Here Be Dragons produced last year with co-producer Peregrine Andrews on Soundproof (Australian Radio National). I only ever use the MD 46 or our shotgun mic. I chose the shotgun for a day when I was hiking in the field with a group of researchers and I didn’t know who would be talking and how close I would be to them. It worked well but it wasn’t the best for things like trying to get the sound of the campfire. It sounded too close to the fire and lost some of the ambient sounds that our ears would pick up. I use a Rode shotgun mic for nearly all interviews and bring an Audio Technica condenser omni for ambi. Reasons: The Rode is affordable and decent — it seems to have a slightly wider angle of incidence than the more expensive shot I used to use, making it ideal for interviews and possible to use for ambi if I don’t have an omni along. I also appreciate that if I lose it or it gets “appropriated” it’s not a financial loss on the scale of that more expensive mic. There are so many choices available, and this list certainly doesn’t cover all of them. What mics are you using in the field? How’s it working out for you? Let us know on Twitter: @nprtraining. You can also email us: trainingteam@npr.org.